The most extreme of extreme sports? The first World Base Race was held in Romsdalen, Norway in the summer of 2008. Jumping from a cliff approx. 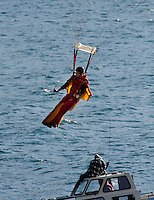 750meter above the fjord the contestants , dressed in wingsuits, race down the mountain.